It is not uncommon to hear people of differing faiths claim that we all worship the same God. At the same time, many of these same people will make the claim that we are all God’s children. Considering what the Bible teaches, who are the children of God? A short Bible study will provide the answer. What makes our children different from others? It is no secret that our biological children are considered to be our offspring. They usually look like us and, good or bad, they usually grow up to be like us. This being said, our children, both biological and adopted, learn many things from us. Therefore, it is important that we carefully consider what we teach them and what we expect from them in both word and deed. Most people name their children with at least a first name and a family name. The first name is typically one that is used to refer to the child on a day-to-day basis. Some cultures may vary in the use of a family name, but the point is that children come to be known or associated with their family name. Likewise, the family name can be influenced either positively or negatively by our children as well. Combined, these factors such as the name, biology, behaviors and even looks are what makes our children uniquely ours and different from others. What makes God’s children different from others? The answer to this question supposes that there are people that are not God’s children. If we are all God’s children, then it would be expected that there would be some common factors that all of us possess as well. For example, when it comes to our name, do we claim the name of Jesus Christ and consider ourselves to be Christians (John 20:31; Acts 4:10; Acts 11:26; 1 Corinthians 6:11; Philippians 2:10; Colossians 3:17: 1 Thessalonians 1:12; 1 Peter 4:16)? As children of God, we are given a new name. Spiritually speaking, we have overcome the world by our faith in Christ (1 John 5:4-5). When we overcome by faith in Christ, the Bible tells us that we are given a new name by God (Revelation 3:12). When it comes to biology, have we been born again into God’s family? Do we have the seed of God in us? In other words, is the Holy Spirit/Christ in us (John 14:15-20; Romans 4; Romans 9:6-13; 1 Corinthians 15:35-50; Galatians 3:16-29; 1 Peter 1:23; 1 John 3:9)? And, if Christ is in us, do we behave like Christ? In other words, when people look at us, do they see any similarity to Christ, the Son of the Father? They should see similarity to Christ because the Bible teaches us that Christ is our example (1 Peter 2:21-23). When we follow the example of Christ, like our earthly parents, He influences our hearts and minds, which enables us to be conformed to His image and become more like Him. God intended that this would happen to His children; to become conformed to the image of His Son, Jesus (Romans 8:26-29). As God’s children, we are expected to learn how to live our life by what God expects of us. Studying the Word of God is how we learn to live our lives so that we meet with God’s approval (2 Timothy 2:15). What makes someone a child of God? Some people can look and act like a child of God, but what makes them a child of God is different than what most people believe. The Bible tells us about being a child of God in Galatians 3:26: “For ye are all the children of God by faith in Christ Jesus.” We see that it is faith in Jesus Christ that makes us children of God. God tells us that when we have faith in Jesus Christ, we also become the children of Abraham. As the children of God and Abraham, we are heirs of the promises that God made to Abraham and his children (Galatians 3:6-9; Galatians 3:29-4:6). The Bible says that whoever believes that Jesus is the Christ is born of God (1 John 5:1). If we are born of God (born again), then that makes God our Father (1 Thessalonians 1:1-3) and we are His children as sons and daughters (1 John 3:1). 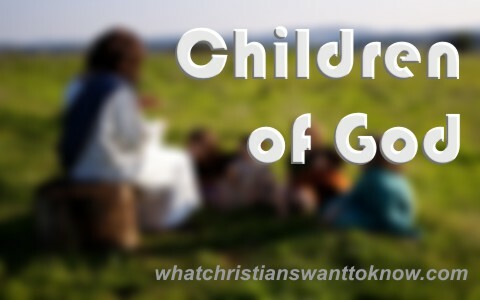 How do we know who are and are not children of God? We find the answer to this in 1 John 3:10: “In this the children of God are manifest, and the children of the devil: whosoever doeth not righteousness is not of God, neither he that loveth not his brother.” According to this verse, people described as “those who doeth not righteousness” are not of God. On the other hand, believers are those who do righteousness. The Bible tells us that righteousness is not because of anything we do, it is because of what God does. Simply stated, those that believe that Jesus is the Christ are born again as children of God. Those who do not believe that Jesus is the Christ are not born again as children of God. If they are not children of God, then who are they children of? The Devil according to 1 John 3:10 as we just read above. This is reinforced by the fact that they do not believe that Jesus died on the cross to pay for their sins (John 3:16). They do not believe their sins have condemned them to Hell (Romans 6:23). And, their unrepentant condition leaves them without hope because they are deceived (1 Corinthians 15:12-20; 2 Corinthians 4:3-6). Therefore, we are not all God’s children. People of differing faiths commonly claim that we all worship the same God and that we are all God’s children. This is because they do not understand that the Bible says that only those who have faith in Christ are the children of God. Those that reject Christ are described as being the children of the Devil. Therefore, we are not all God’s children. Nicely done Dr. Williams. So true. This shows the difference between the children of God and the children of their earthly father. ||On Monday the Bishop Of Rome addressed Catholic followers regarding the dire importance of exhibiting religious tolerance. During his hour-long speech, a smiling Pope Francis was quoted telling the Vatican’s guests that the Koran, and the spiritual teachings contained therein, are just as valid as the Holy Bible.